ставлення до пам'яток культури, любов до рідного краю. До уроку додається детальне зображення слайдів. Тема : Britain and British. Британія та британці. ставлення до пам’яток культури, любов до рідного краю. Обладнання: підручник, карта частин Британії, фотографії визначних місць Великої Британії, мультимедійна дошка. Greeting. Introduction of the lesson. T: Good morning, dear students! I am glad to see you at our lesson. How are you? I hope you are fine. Are you ready for the lesson? (Pl: yes, we are). Fine. 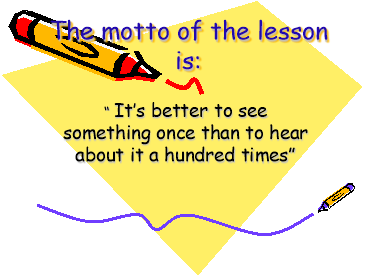 The motor of our lesson is “ It’s better to see something once than to hear about it a hundred times”. -will be able to make a Fact File about the country. 1. Pl 1. It is Australia. The capital is Sydney. Pl 2. It is the USA. The capital is Washington. Pl 3. It is Ukraine. The capital is Kyiv. Pl 4. It is Canada. The capital is Ottawa. Pl 5. It is Great Britain. The capital is London. T: You are clever children. I think that your teacher of geography is satisfied with you. 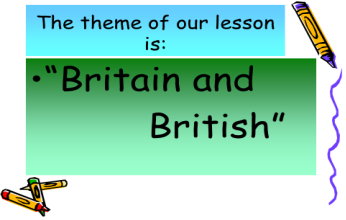 T: Dear children, can you guess what the theme of the lesson is? Pl: I think that it will concern with the geography of Great Britain. Today we are going to talk about the country, the language of which we learn. 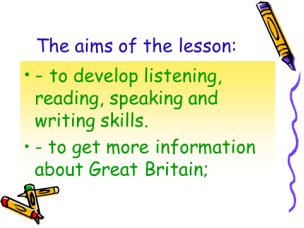 We have already learned a lot of information about Great Britain. III. Main part of the lesson. T: I prepared a text for you to read. 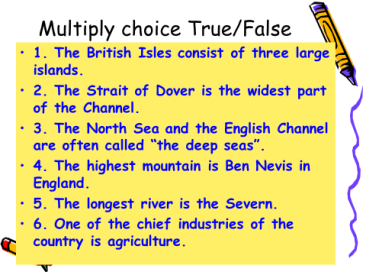 After reading it you are to answer the questions and say whether the statements are true or false. The full name of the country is the United Kingdom of Great Britain and Northern Ireland. The United Kingdom of Great Britain and Northern Ireland (the UK) occupies most of the territory of the British Isles. It consists of four main parts: England, Scotland, Wales and Northern Ireland. London is the capital of England; Edinburgh is the capital of Scotland, Cardiff – of Wales and Belfast – of Northern Ireland. The UK is a small country with an area of some 244,100 square kilometers. The British Isles consists of two large islands: Great Britain and Ireland, and a great number of small islands. Their total area is over 325,000 square kilometers. It is washed by the Atlantic Ocean in the north-west, north and south-west and separated from Europe by the North Sea in the east and by the English Chanel in the south. The Strait of Dover is the narrowest part of the Channel. The North Sea and the English Channel are often called “the narrow seas”; they are not deep but are frequently rough and difficult to navigate during storm. The Britain’s main ports are London, Liverpool, Glasgow, Hull and others. The UK is highly developed industrial country. One of the chief industries of the country is shipbuilding. One will not find very high mountains or large plains in Great Britain. The highest mountain is Ben Nevis in Scotland 4,406 feet high. The longest river is the Severn, in England about 200 miles long, but the deepest is the Thames. The population of the United Kingdom is over 57 million people. The official language of the United Kingdom is English. The UK is a constitutional monarchy. What is the full name of the country? 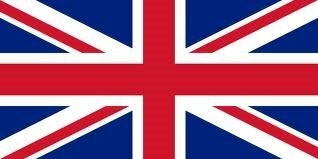 Pl: The full name of the country is United Kingdom of Great Britain and Northern Ireland . What are the main parts of the United Kingdom? Pl: The main parts of the United Kingdom are England, Scotland, Wales and Northern Ireland. What is the total area of the United Kingdom? Pl: The total area of United Kingdom is over 325,000 square kilometers. What is the narrowest part of the English Channel? 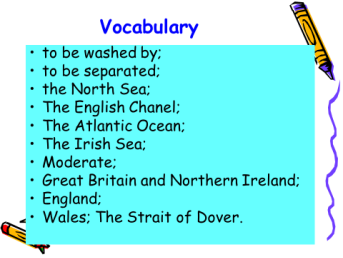 Pl: The Strait of Dover is the narrowest part of the Channel. What seas are difficult to navigate during storms in? Pl: In the North Sea and the English Channel are difficult to navigate during storms. Is the UK highly developed industrial country? Pl: The UK is highly developed industrial country. 7: What is the official language of the United Kingdom? Pl: The official language of the United Kingdom is English. What are the main ports of the UK? Pl: The Britain’s main ports are London, Liverpool, Glasgow, Hull and others. T: You have done this work very well. But you have another assignment. Now you’ll see some sentences. You have to say if the sentence is correct or not. 1. The British Isles consist of three large islands. 2. The Strait of Dover is the widest part of the Channel. 3. The North Sea and the English Channel are often called “the deep seas”. 4. The highest mountain is Ben Nevis in England. 5. The longest river is the Severn. 6. One of the chief industries of the country is agriculture. 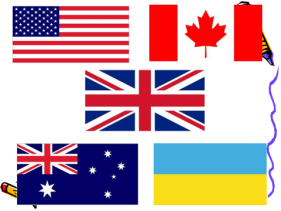 Keys: 1 F, 2F, 3F, 5F, 6 T, 7 F.
T: Last time I asked you to prepare some interesting information about the parts of the Great Britain. Who wants to speak? Pl 1: It is very important to know that England is the largest of four parts, which make up Great Britain. It’s industrial and most densely populated part of the United Kingdom. Over 46 million people of the population of United Kingdom live in England. The capital of England is London. Stonehenge is one of the most famous prehistoric places in the world. This ancient circle of stones stands in Southwest England. Not far from Stonehenge stands Salisbury Cathedral. It is a splendid example of an English Gothic Cathedral. There are many rivers in England. The longest is the Severn (338kl), the most important is the Thames. The rivers are very important for communication and carrying goods. I was impressed by beautiful gardens all over England. By the way, the symbol of England is a red rose and English people are crazy about gardening. PL 2: Scotland is the country in the north of Great Britain. It is a part of the United Kingdom. Scotland is very beautiful! There are mountains, valleys, lakes and hundreds of islands. Scotland is full of mountains and lakes. The highest mountain is Ben Nevis. There are a lot of rivers there. Scotland is also the land of myths and mysteries; every castle has its ghost. Glamis Castle is said to have nine of them. The most famous lake is called Loch Ness. It is very deep and some people believe that a mysterious creature lives at the bottom. This monster is often called “Nessie”. Nessie is said to be about six meters long. The capital of Scotland is Edinburgh. Every summer it has a huge festival: artists, poets, musicians and actors from all the world go there. There are two large cities here: Glasgow and Aberdeen. Glasgow is the industrial capital of Scotland. Golf is the Scotland national sport and seems to have originated in this country. 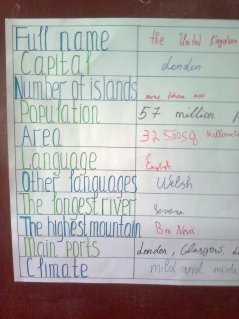 Pl 3: Wales is the part of Great Britain. The oldest symbol of Wales is a red dragon. There are very beautiful mountains on the north of Wales. They are Britain’s second highest mountains. Snowdonia is the picturesque region in Wales. Snowdon is the highest mountain in England and Wales. The capital of Wales is Cardiff, the largest city of Wales. It is an important industrial city and a port. It is also an administrative and educational centre. I was surprised when I learnt that there are 2 official languages in Wales, Welsh and English. Children study Welsh at school. The Welsh people are fond of music, singing, poetry and drama. Every year the Eisteddfod Festival is held in Wales. Pl 4: Northern Ireland is the smallest part of the United Kingdom. It occupies only one sixth of its territory, and it is situated on the northeast of the island Ireland. Belfast is the capital of the Northern Ireland. The population of Northern Ireland is about 1.5 million people. 53 per cent of the total population lives in urban areas. The whole economy of Northern Ireland is closely integrated with that of Great Britain. Belfast, the capital of Northern Ireland is the leading industrial centre and a large port. Its main industries are the production of linen and other textiles, clothing, shipbuilding, engineering. You will see everything in Ireland is green; in fact its other name is “the Emerald Isle”. Green is one of the symbols of Ireland and everybody wears green on Saint Patrick’s Day, the Irish national holiday. T: You know very interesting facts. T: Are you tired? Let’s play a quiz-game “What do you know about Great Britain?" 1. England is the largest and the richest country of_________________. 2. The capital of England is_______________. 3. __________ is one of the most famous prehistoric place in the world. 4. ________ Stonehenge stands Salisbury Cathedral. 5. Scotland is the country _________ of Great Britain. 6. The capital of Scotland is _____________. 7. Glasgow is the __________ capital of Scotland. 8. ________ is the Scottish national sport. 9. Nessie is said to be about ________. 10. The oldest symbol of Wales is a _________. 11. Snowdonia is the picturesque region in Wales. 12. The capital of Wales is_________, the largest city of Wales. 13. There are ________languages in Wales, Welsh and English. 14. __________is the smallest part of the United Kingdom. 15. 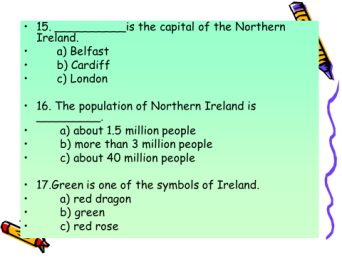 __________is the capital of the Northern Ireland. 16. The population of Northern Ireland is _________. 17__________ is one of the symbols of Ireland. T: I prepared a text for you to listen to. 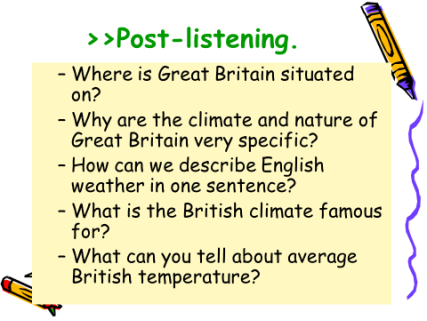 After listening to it you are to answer the questions and fill in the gaps with the proposed words. Great Britain is situated on the island. It is washed by seas from all the sides. That’s why the climate and the nature of Great Britain are very specific. It is not very cold in winter and never hot in summer. There is no ice on the lakes and rivers in winter. It rains very often in all the seasons. The weather changes very often. Britain is famous for its fogs. Sometimes fogs are so thick that it is impossible to see anything within 2 or 3 metres. Average British temperature does not rise above 32 C in summer and does not fall bellow -10 C in winter. We may say that the British climate is mild and very changeable. T: So, you have listened to the text and now you have to answer some questions after it. Where is Great Britain situated on? Why are the climate and nature of Great Britain very specific? How can we describe English weather in one sentence? What is the British climate famous for? What can you tell about average British temperature? Now on the board you see four sentences with missing words. You have to fill in the gaps with the proposed words. 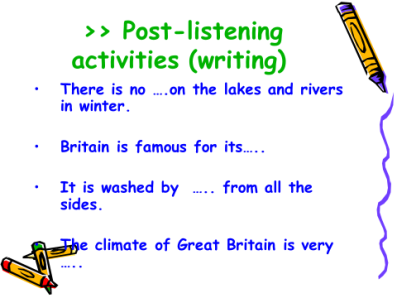 There is no ….on the lakes and rivers in winter. Britain is famous for its….. It is washed by ….. from all the sides. 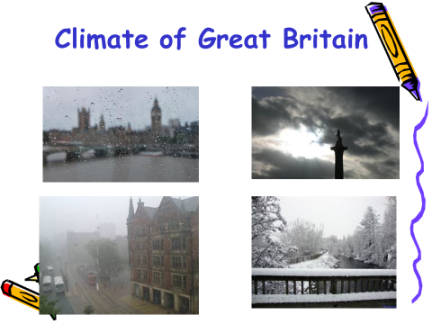 The climate of Great Britain is very …..
Keys: 1. ice, 2.fogs, 3.seas, a.specific. The, Great, is, island, in, Britain, Europe, largest. The, 57, is , population, of, the United Kingdom, people, million, over. 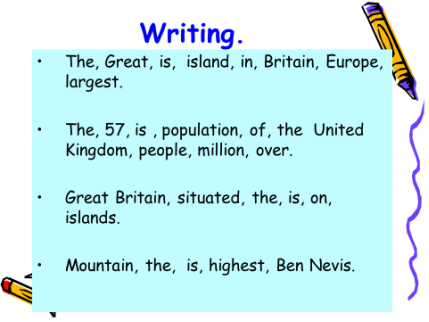 Great Britain, situated, the, is, on, islands. Mountain, the, is, highest, Ben Nevis. T: And now is crossword is for you! 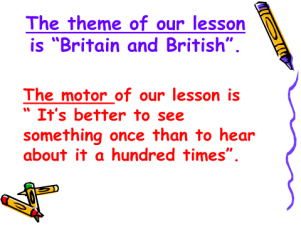 T: During the lesson we’ve talk about Great Britain. Now we will sum all our knowledge in the form of “Fact File”. Let’s start. T: So, our lesson is going to be over in a few minutes. And I must say that our lesson was very useful. You got a lot of good information about Great Britain. Was it interesting for you? Are you tired? I think you aren’t. I think you are full of energy and desire to learn more about this wonderful country. You work hard. We had an interesting communication at the lesson. Your marks for the lesson are….. 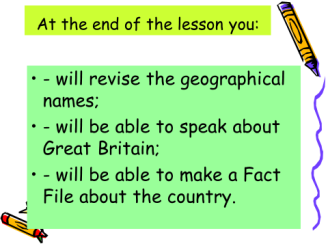 Your home task for the next lesson will be to talk about Great Britain using the Fact File. 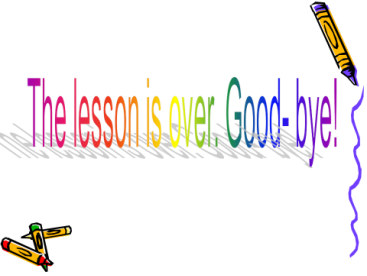 The lesson is over. Good- bye! 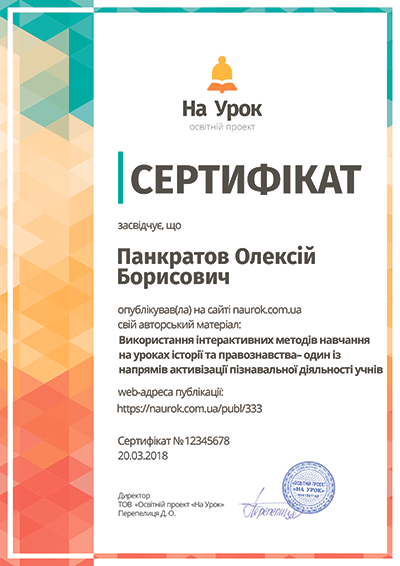 Презентація до уроку англійської мови у 8 класі з теми "Books in our Life"
Презентація до уроку англійської мови у 8 класі з теми "Passive Voice"
Матеріали до уроку англійської мови у 8 класі з теми "Work in a Team"